I've been a big fan of Inch Blue since I stumbled across their cute shoes in a very early issue of Junior Magazine. 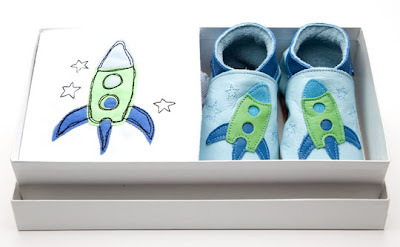 Over the years my three little ones they clocked up around 40 pairs and I've always sung their praises to new mums as they are the only baby shoes that really do stay put. They come in so many styles and colour combinations that it's not difficult to see why we had so many and they are handmade in the UK. Their shoes start from £17 in sizes from birth to four years and for a fab new baby pressie idea take a look at these cool vest and shoe combination giftsets at £32 in sizes 0-6 mths and 6-12 mths. This competition closes at midnight GMT on 28/03/11. Well I am hoping this is not a trick question!! So I say c) 8!! Having googled it I now think 2 as apparently the other 6 are arms not legs. Lovely shoes! The rocket ships are adorable. I'll go for 8, as the name octopus suggests. Zoom shoes are zoom-tastic! Thank you! I'm taking a wild guess at 8. I am sure the answer is 8 legs! 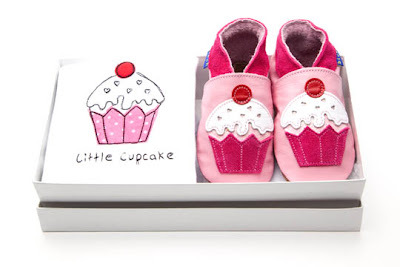 These are gorgeous, I would love the cupcake ones for my little girl who is due in the next few weeks. I believe the answer to be c-8. Love the prize, fingers crossed. answer c) 8. Those shoes are so cute. The answer is - 8! Gotta be 8 hasn't it. Oh the pink shoes are lovely - so cute and girly! Let me think!!!! I know it's c) 8 - loving the blue set, I know just the little one these would fit. It is c)8 unless their is a weird octopus I don't know about. providing the octopus hasnt been involved in a terrible accident with a boat engine it will have 8 legs.